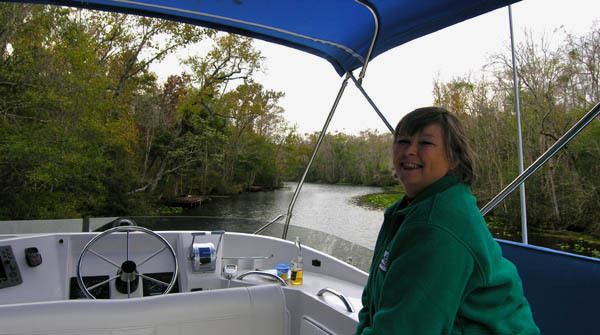 During our brief visit to Sno' Dog in December, we cruised south on the St. Johns river as far as Palatka - some 40 miles to the south of Jacksonville. Looking ahead to the time when we hope to spend our winters in a warm southern location, we checked out some waterfront properties in this area. 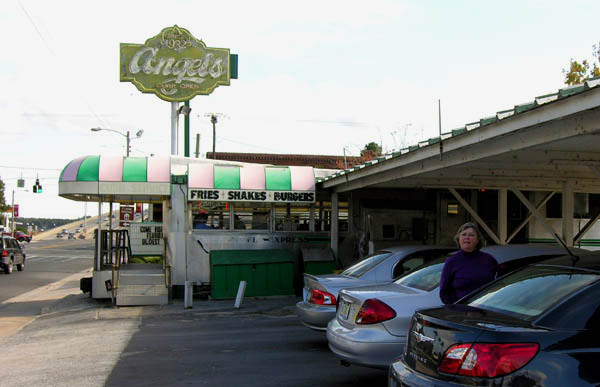 In Palatka, we had lunch at Florida's oldest diner - in continuous operation for 75 years! Curb service available. 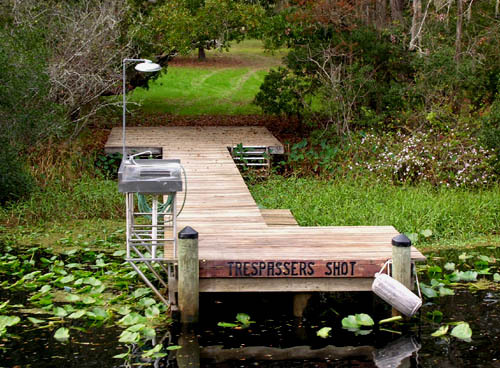 Cruising up the Trout River south of Green Cove Springs - definitely rural! We found this lovely spot 3 miles up the Trout River off the St. Johns in the "town" of Elwood There may still be some waterfront bargains here, but Nancy wasn't too excited about being in the boondocks. She much preferred the downtown location in Green Cove Springs. Not all residents along the Trout River area were quite as welcoming! 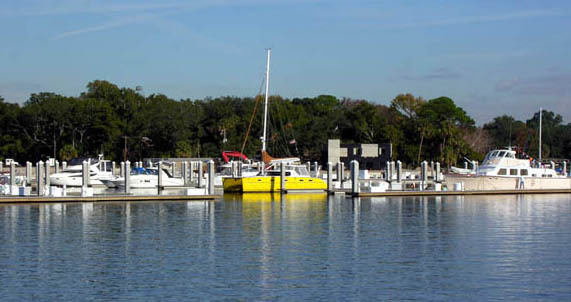 So, for the moment Sno' Dog remains berthed in a covered slip at Lamb's Yacht Center on the Ortega River near Jacksonville. We hope to get back later this winter and perhaps venture further into the tropical part of Florida. It sounds as though we may need to work our way south to Ft. Lauderdale by next spring as I gather this will be the pick-up point for the Baltic Cruise - instead of Jacksonville. 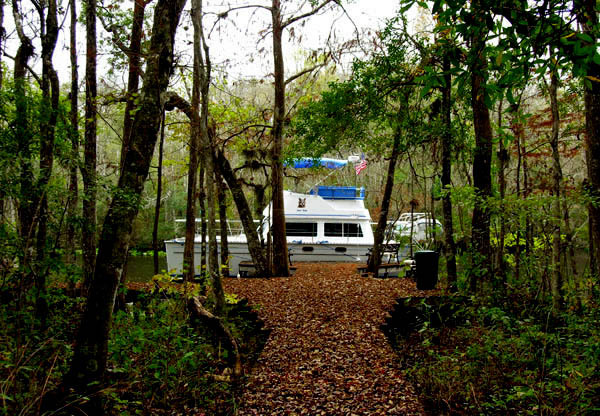 At this marina on the Ortega River, ONE BOAT STANDS OUT! It's a real Eye Catcher! 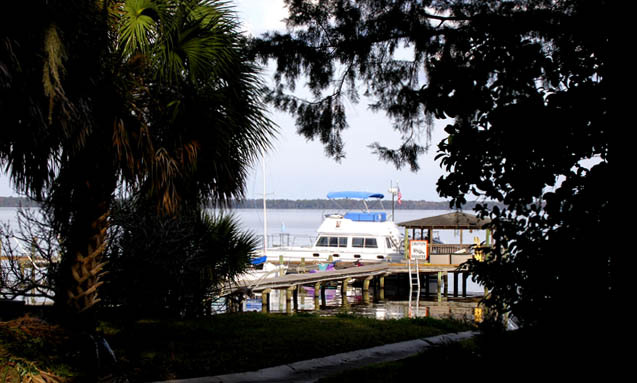 The St. Johns River is appealing in that it basically becomes fresh water (as you head south of Green Cove Springs) and, while providing access to the worlds oceans, it is well protected against hurricane damage. Also, we were hoping property values might be lower than in more southerly Florida locations. 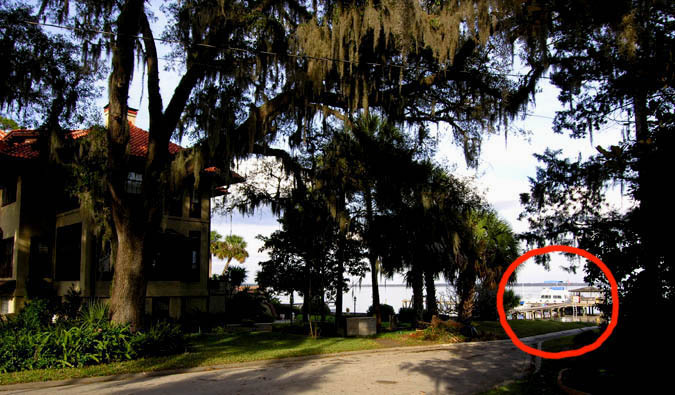 We did find a condo in the "Hoyt House" pictured above which included a dock offered for a mere $275 K. (But we didn't buy it). The Trout River offers some scenic and protected cruising, and it's fun to poke into places like this in our versatile PDQ, but it's probably not a place we'd want to live.